Paul Lincke (1866-1946) may well not be a familiar name. He was a German composer and conductor of operettas, who lived in Berlin. When the Nazis came to power, he was very much favoured by the regime, and this caused him some difficulties with the Allies in his last year. Today he is best known for what is almost the "city anthem" of Berlin, Berliner Luft (Berlin Air), for a song, The Glow-worm, which became a 1952 hit when Johnny Mercer revised and expanded an English version (translated by a very distant cousin of mine) for the Mills Brothers, and for a wedding dance performed in the film Titanic as the ship went down. 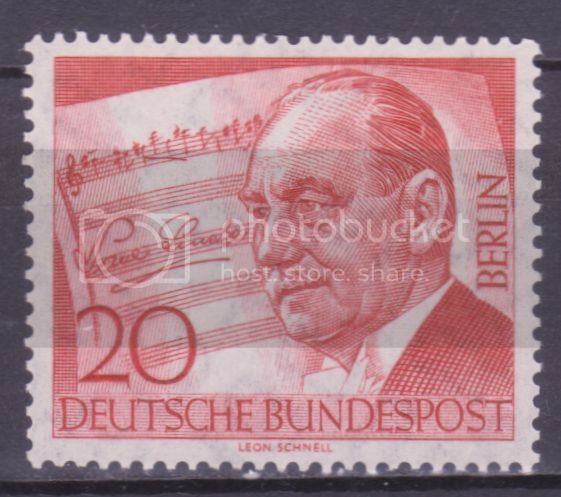 In 1966 West Berlin issued a stamp for the tenth anniversary of his death, SG B152. 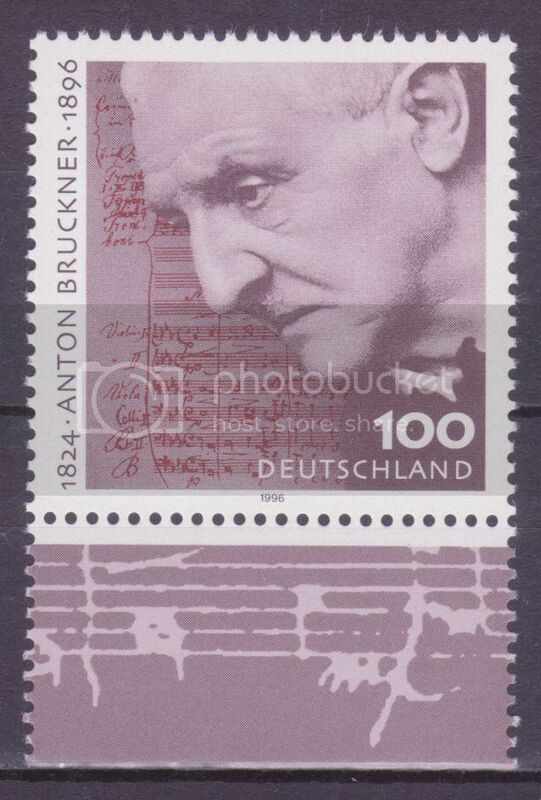 Anton Bruckner (1824-1896) was an Austrian composer most famous for his symphonies and choral works. The symphonies - some very long - frequently evoke the grand landscapes of the Austrian Alps. In contrast, among his best choral works are Motets which last only a few minutes but pack in that time an immense emotional punch, with lots of contrasts of tone - and (as I know from experience) are wonderful to sing, but take a lot of concentration to sing well. In 1996 Germany issued a stamp for the centenary of his death, SG 2739. 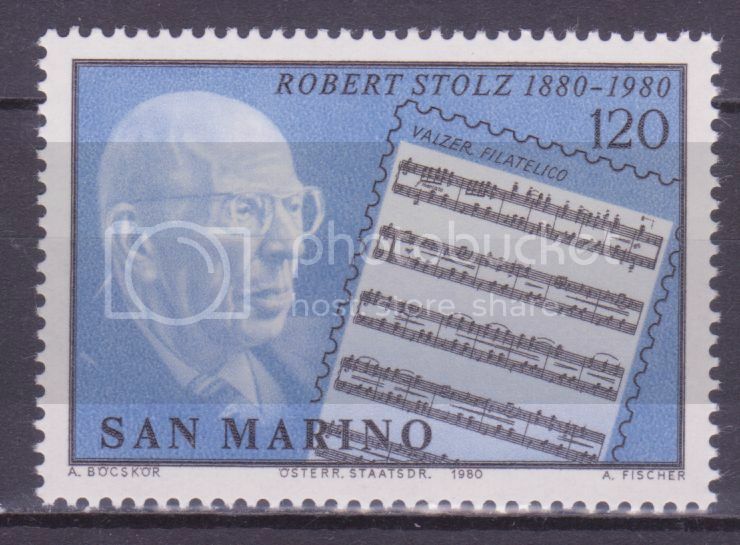 In 1980 San Marino issued a stamp, SG 1151, for the birth centenary of Robert Stolz (1880-1975). He was an Austrian composer of song, operettas, and film music, and a renowned conductor of lighter music. His most famous work is the operetta The White Horse Inn, which was also turned into a film. In childhood he was an infant prodigy giving piano performances. In 1925 he moved to Berlin, but returned to Austria after the Nazis gained power in Germany, and, following the Anschluss, moved to Switzerland and then Paris. In 1940 he was interned in France as an enemy alien, but friends negotiated his release and he sailed to New York, where he conducted popular concerts of Viennese music. In 1946 he moved back to Austria, and there he wrote music for shows on ice. The stamp shows the music for a "Philatelic Waltz". 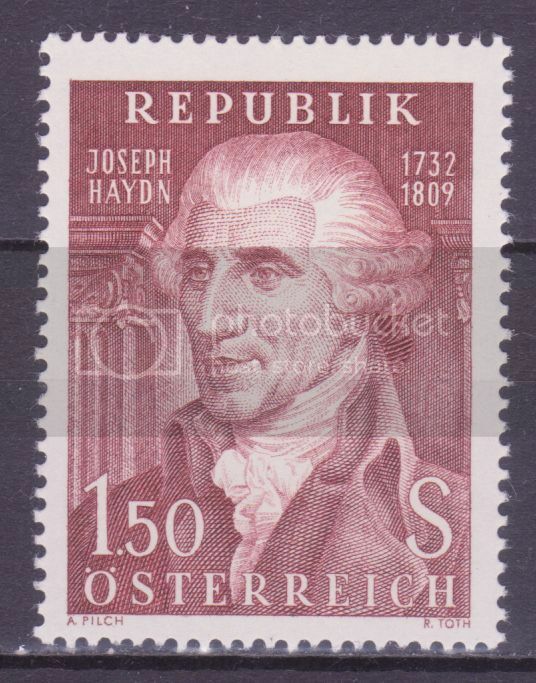 In 1959 Austria issued a stamp for the 150th anniversary of the death of Haydn, SG 1342. 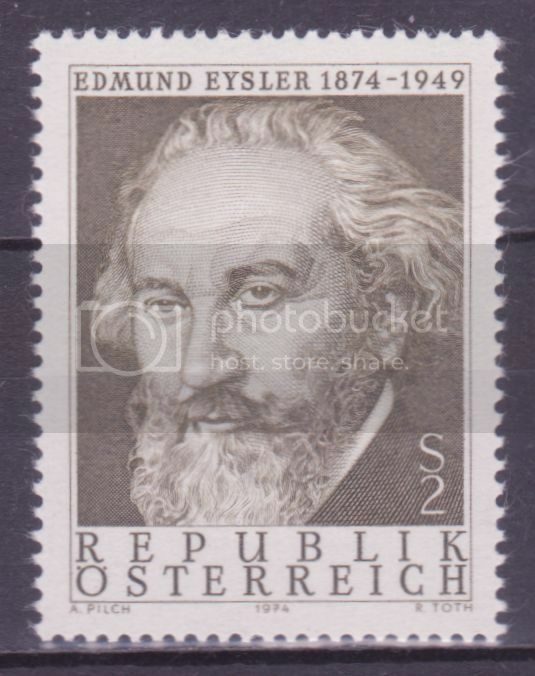 In 1974 Austria issued a stamp, SG 1718, for the centenary of the birth of Edmund Eysler (1874-1949). He was a highly popular composer of some 60 Viennese operettas whose works were banned by the Nazis because of his Jewish family background - even though one of his works was a favourite operetta of Hitler. One of his shows was successfully staged on Broadway in 1915 as The Blue Paradise. When the Nazis took over Austria, he was kept safe by friends. He died from the effects of a fall from the stage. 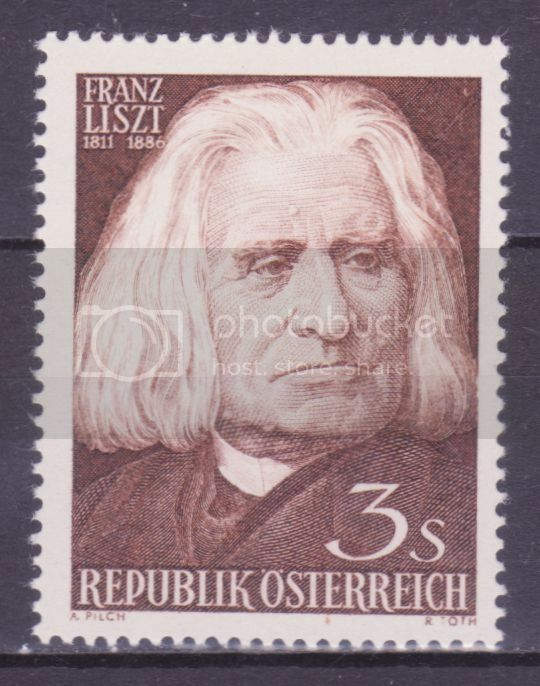 In 1971 Austria issued a stamp for the 150th anniversary of the birth of Liszt, showing the composer in magnificent old age - SG 1377. 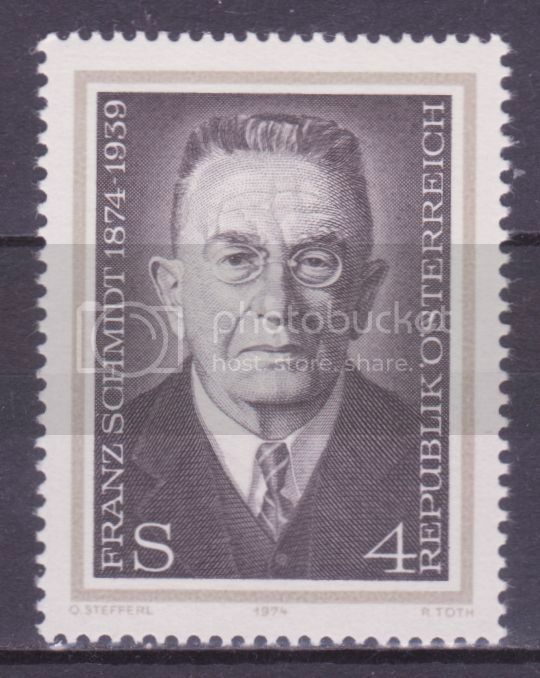 In 1974 Austria issued a stamp (SG 1726) for the birth centenary of Franz Schmidt (1874-1939), an Austrian composer best known outside his own country for four symphonies and an oratorio, The Book with Seven Seals, setting parts of the New Testament book of Revelations. In contrast to his modernist contemporaries, his musical language was basically tonal - using the standard key signatures - though he was fairly adventurous in his use of harmonies. His first wife was confined to a mental institution in 1919, and killed by the Nazis in 1942 under their euthanasia programme. Josef Hauer (1883-1959) was an Austrian modernist composer who developed a form of 12-tone music (using all 12 notes of the chromatic Western scale) before Schoenberg. The Nazis condemned his music as "degenerate" but he stayed in Austria during WW2, continuing to compose but not publishing his new works. Besides musical compositions, he wrote extensively on musical and compositional theory. He had a mystical approach to music, believing that 12-tone music provided an avenue to the spiritual realm. He was a devoted student of the i Ching. 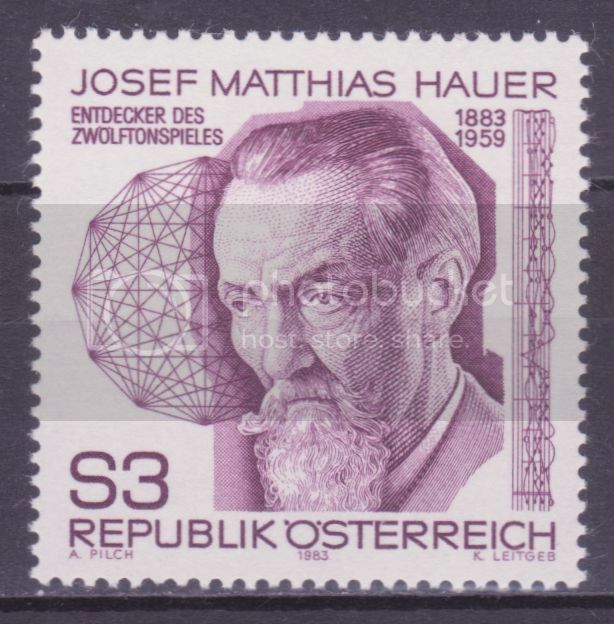 Here he is on an Austrian stamp of 1983, SG 1957, issued for the centenary of his birth. Johann Fux (born in about 1660, died in 1741) was an Austrian composer of, mainly, church music and operas who is best known for an immensely influential book on the art of counterpoint, Gradus ad Parnassum. 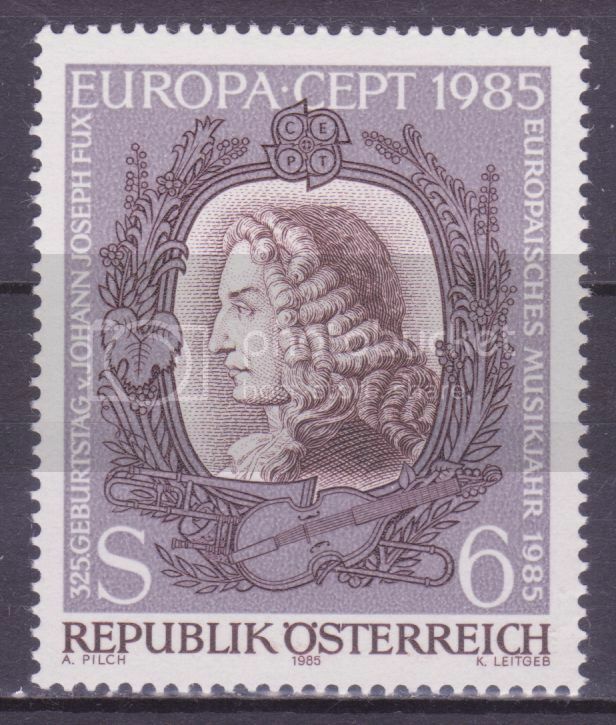 Here is an Austrian stamp of 1985 (when the Europa theme was music), SG 2051. Think of 19th century opera composers and you probably think mostly of people from Italy, Germany and France. Antonio Carlos Gomes (1836-1896) came from Brazil. He was the first South American composer to be acclaimed in Europe, with the success in 1870 of his opera Il Guarany, based on a historical novel set in Brazil at the start of the 17th century. In all he wrote a dozen operas. 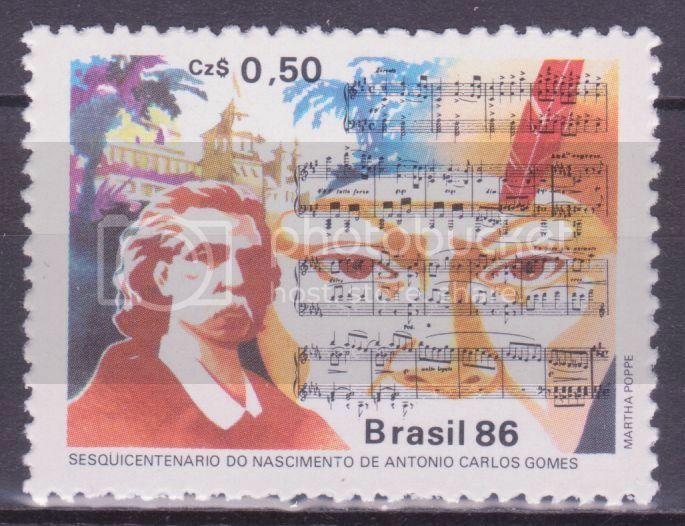 In 1986 Brazil issued a stamp to mark the 150th anniversary of his birth, SG 2222. 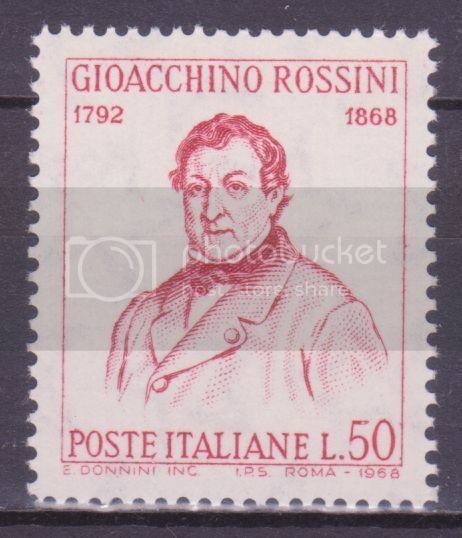 Rossini (1792-1868) was a prolific opera composer, whose best-known work is The Barber of Seville. When I was young, most British children could hum parts of the overture to his William Tell. He was one of the best-paid opera composers of his day, and much of his work was influenced by the style of the comic operas of his beloved Mozart. He retired from writing operas in 1829. In his later years he composed a large number of quirky small pieces, mainly for piano, and the Petite Messe Solennelle (Little Solemn Mass) which is anything but little - it is one of the longest settings of the Mass ever written - and anything but solemn. Besides being a composer, he was famous as a chef and gourmand, and a number of dishes bear his name, including Tournedos Rossini, steak with a crouton and foie gras, served with black truffle and a Madeira sauce. In 1968 Italy issued a stamp for the centenary of his death, SG 1231. 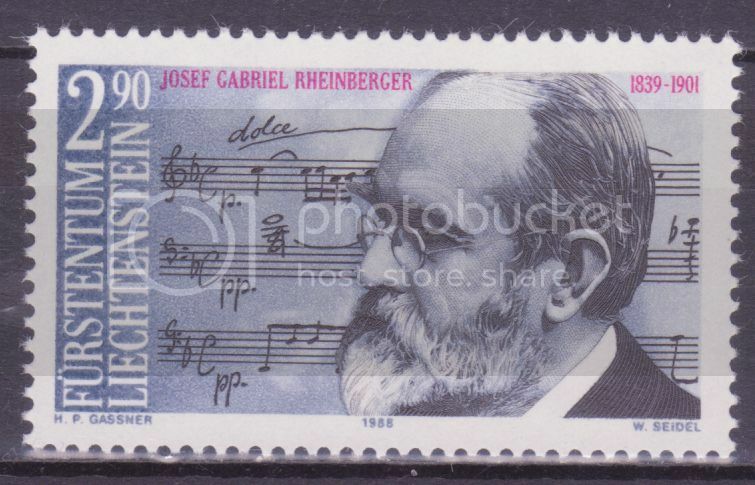 1989 was the 150th anniversary of the composer Rheinberger (1839-1901) and Liechtenstein (where he was born) issued a stamp for the occasion, SG 954. He wrote choral music but is best known for his (generally difficult-to-play) organ compositions. 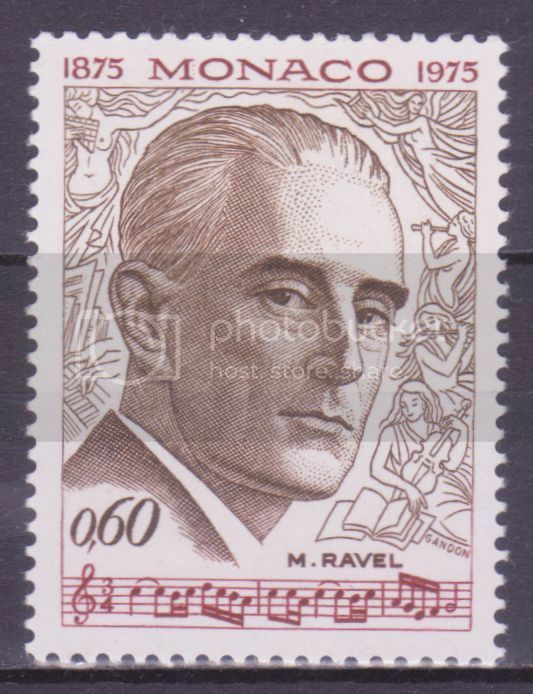 Maurice Ravel (1875-1937) was, with Debussy, one of the foremost impressionist composers. Much of his piano music calls for virtuoso-level skills. He was also a very skilled orchestrator, and his orchestral arrangement of Mussorgsky's Pictures at an Exhibition (originally written for piano) is the one that is generally played. He orchestrated some of his own piano works too - to my mind, the result is usually more lush than the originals, and a little saccharine: I prefer the greater starkness of the original piano versions. His Boléro - originally a short ballet - must be the longest crescendo ever written - starting very quiet, and ending fiercely loud after over 15 minutes of slowly increasing volume - part of the melody is shown on the stamp. In 1975 Monaco issued a stamp for the centenary of his birth, SG 1219. Johann Strauss the younger (1825-1899) was the Viennese Waltz King. His music was used in A Corny Concerto, a 1943 Warner Bross parody of the Disney cartoon film Fantasia. In one of the 20th century Russian masterpieces of fiction, The Master and Margarita by Bulgakov, Johann Strauss conducts the orchestra in a great ball hosted by Satan. 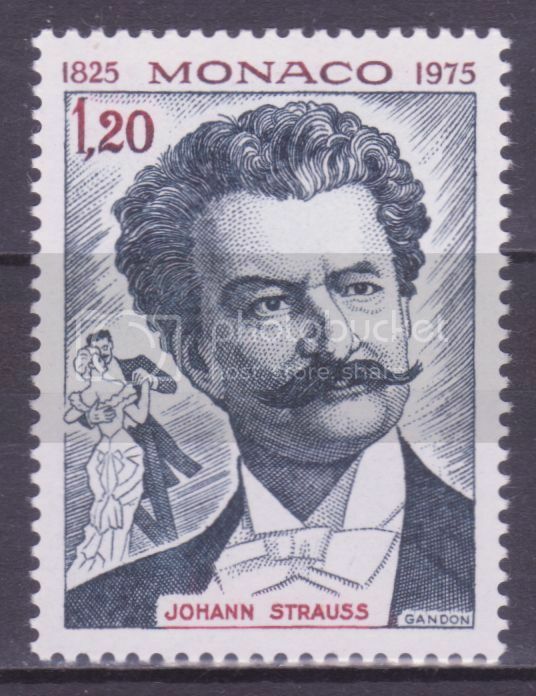 Johann Strauss appears on a 1975 Monaco stamp, SG 1220. Camille Saint-Saens (1835-1921) was a French romantic composer. Among his best-known works are the opera Samson and Delilah, Carnival of the Animals, and his Symphony No. 3 (often called the Organ Symphony) whose last movement includes some very low organ pedal notes which are fully audible only in very good acoustics with very good organs. He was one of the first well-known composers to write a film score - for the film L'assassinat du duc de Guise (The Assassination of the Duke of Guise, 1908). He walked out in disgust from the first concert performance of Stravinsky's The Rite of Spring, and loathed the music of Debussy, saying at one point, "I have stayed in Paris to speak ill of [Debussy's opera] Pelléas et Mélisande." 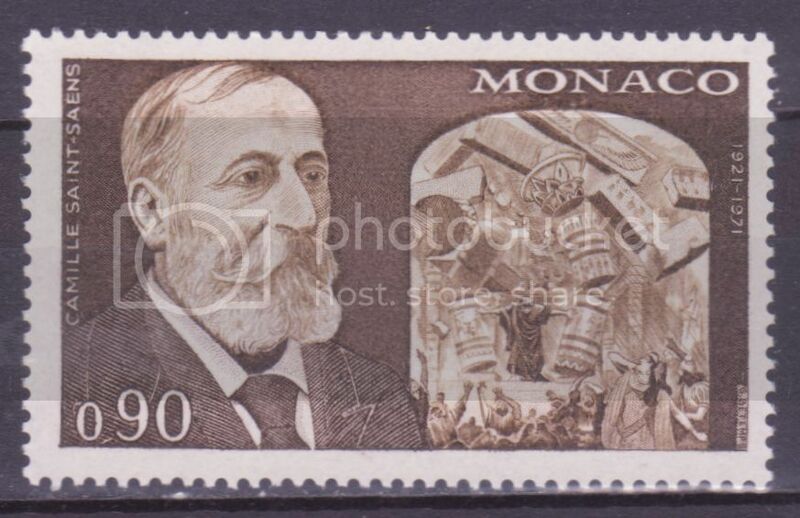 In 1972 Monaco issued a stamp for the 50th anniversary of Saint-Saens' death, SG 1027. 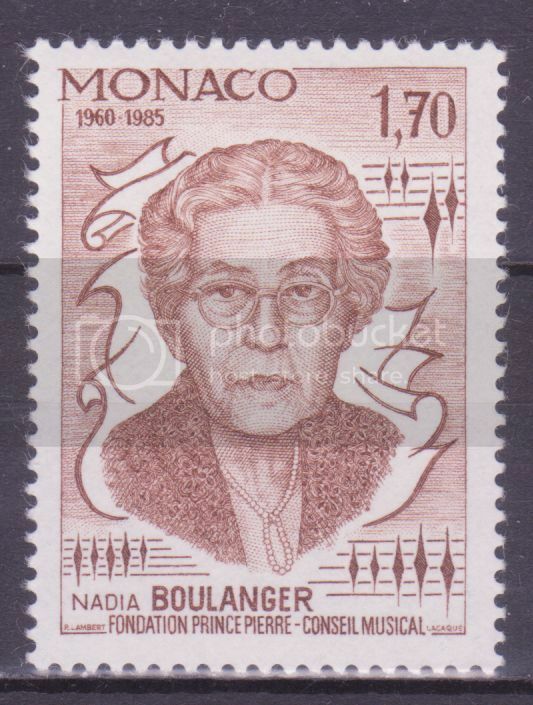 Nadia Boulanger (1887-1979) was a French composer, conductor, teacher and player of piano and organ. She wrote mainly vocal, choral and chamber music, but is most remembered as a teacher. She taught some of the leading conductors, performers and composers of the 20th century. Her knowledge of music was encyclopaedic, ranging from early medieval music to the avant-garde, and she taught practitioners and composers of many different genres, not just classical music, including Aaron Copland, Philip Glass, Burt Bacharach and Michel Legrand. The Wikipedia list of those she taught includes a large number of well-known names. In 1985 Monaco issued a stamp featuring her, SG 1731. 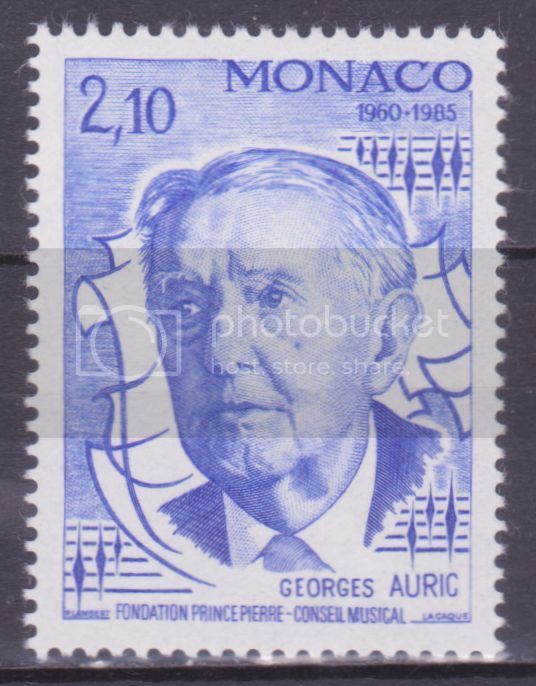 George Auric (1899-1983) was a French composer who was one of Les Six, a group of 6 composers (the most famous being Poulenc) who reacted against the music of Wagner, Debussy and others and who sought to incorporate elements of popular and circus music of their time in frequently very witty compositions. From the 1930s wrote scores for many films, among them Beauty and the Beast and Orpheus, both directed by Jean Cocteau, and the Ealing comedies Passport to Pimlico, The Lavender Hill Mob and The Titfield Thunderbolt. In 1985 he featured on a Monaco stamp, SG 1732. 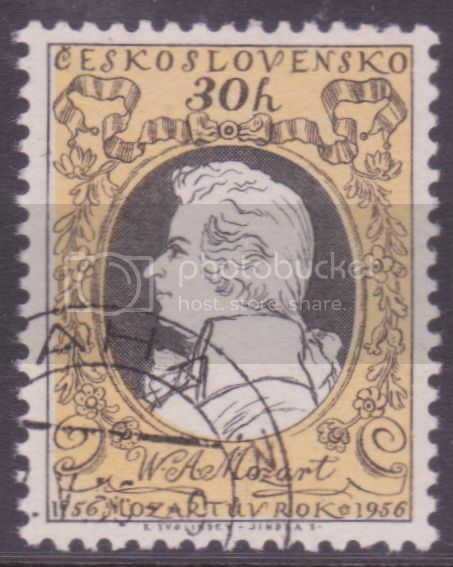 In 1956 Czechoslovakia issued a set of 6 stamps for the bicentenary of Mozart's birth. One of them shows the man himself - SG 929. 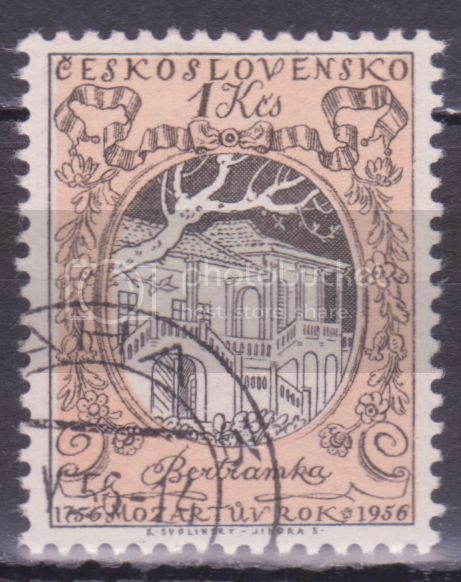 From the Czech 1956 set for Mozart's bicentenary, a stamp showing the Villa Bertramka (SG 932), where Mozart probably stayed in 1787 when he was in Prague to conduct his opera Don Giovanni. He was the guest of Frantisek Xaver Dusek (a composer) and his wife Josefina Duskova, an opera singer for whom Mozart wrote some of his music. The villa now is a concert hall and has a Mozart exhibition. 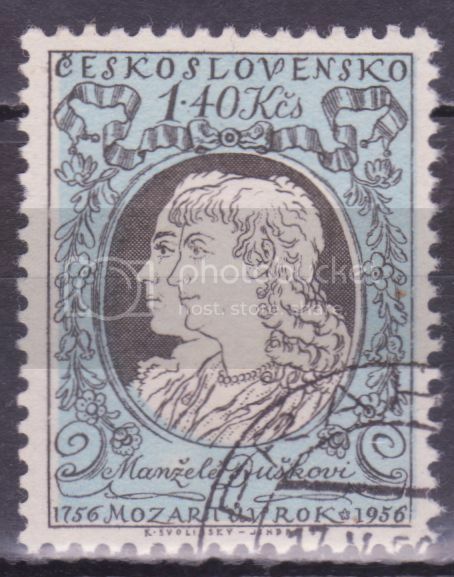 This stamp, SG 933, from the Czech 1956 set for the Mozart birth bicentenary shows the Czech composer and keyboardist Frantisek Xaver Dusek (1731-1799) and his wife, the soprano Josefina Duskova. Amonng Frantisek Dusek's works are sonatas, concerti, symphonies and string quartets. He and his wife were friends of Mozart.